These are the most common phrases that we hear in movies when the scene shows a woman in complete agony while giving birth. While we completely understand that movies are fiction, scenes like these still send wrong signals for women. We often associate birth giving to pain and breathlessness. Breathlessness is often associated with pregnancy. This is a fact that I personally know. During pregnancy, we will require more oxygen, so our bodies adapt by creating changes in the production of hormones. The increased amount of hormones will have a direct effect on our lungs, changing the way we take in oxygen. In the last trimester, this feeling of breathlessness will become more profound as your baby puts more pressure on your diaphragm. Mums-to-be who are carrying babies high inside the womb, who have excessive amniotic fluid, or carrying multiples, are even more prone to having breathing problems. Breathing exercises are often ignored by women who are pregnant. While breathing difficulty may not necessarily pose a danger to your pregnancy, not learning how to control your breathing may give you problems during the actual childbirth. Hypnobirthing Home Study Course will help improve breathing using techniques that will help you focus on the right intake of oxygen. As an added benefit, research shows that focused breathing during childbirth helps release endorphins, a tranquilising hormone which can help you manage pain better. In short, focused breathing will help mothers-to-be create a safe delivery for their babies. It will also lessen the stress both for mothers, the baby and those participating in the birthing process. I experienced first hand the beauty of being a mother, from nurturing your child within your body to the day of birthing. This is why I always share opportunities with other mothers on how they can better manage their pregnancy concerns better. 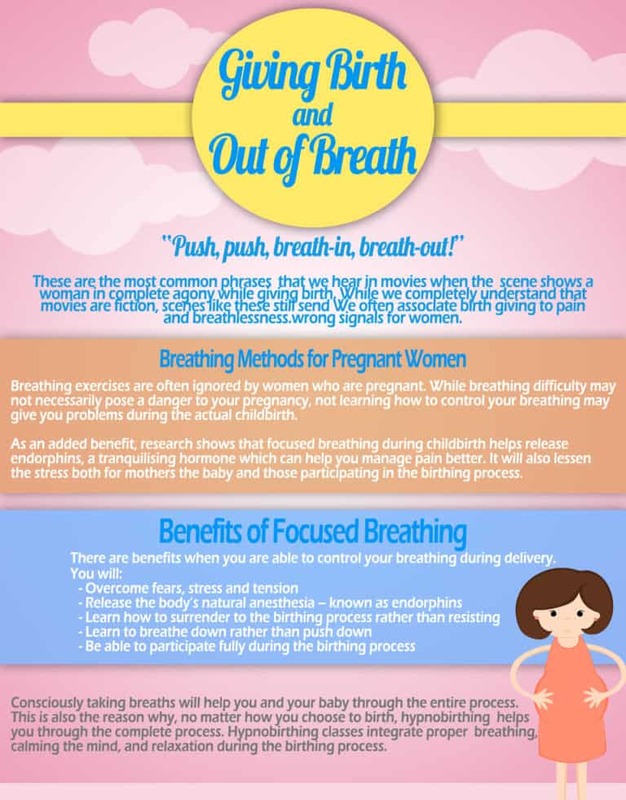 Learning how to properly breathe is an integral part of pregnancy and childbirth. Consciously taking breaths will help you and your baby through the entire process. This is also the reason why, no matter how you choose to birth, hypnobirthing helps you through the complete process. Hypnobirthing classes integrate proper breathing, calming the mind, and relaxation during the birthing process. Remember to constantly revisit our blogs for more pregnancy and birthing articles.